Caravans and motorhomes may not initially seem to fit the back-to-basics Cool Camping vibe, but when it comes to taking a set of wheels on the open the road there's no doubt it opens up a whole new world of opportunities. With the best campervan hire companies now listed right here on coolcamping.com, we feel it's time to shed light on the four-wheeled world of camping. 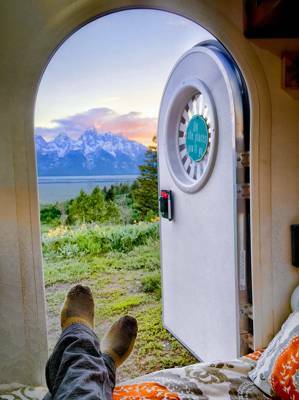 And nothing highlights the joy of campervan travel better than these incredible photos gathered from road trippin' bloggers around the world. When award-winning insurer for campervans, motorhomes and caravans, Comfort Insurance first asked bloggers to get in touch with their best photos they expected a small trickle of pictures. It was a celebration of the company's 25th birthday and they were keen to gather some superb images of campervans and caravans around the world. Still, their expectations were nothing out of the ordinary. The usual images of a caravan in a woodland campsite, perhaps. A motorhome parked up on the curb or a family gathering underneath the awning of a Winnebago. What they discovered, however, was a mind blowing collection of incredible images from all four corners of the globe. We've put together a quick 'top 5' selection of some of the best shots taken by keen campervanners out on the road around the world. To view more simply visit the Comfort Insurance website. From wintery shots in the USA to mountain peaks in France and beachside locations in Greece, this gathering of images shows that with the right set of wheels you really can make the world your oyster. And there's no time like the present to go on an adventure, with endless options awaiting you on the open road. If you still want to hit the open road but don't fancy forking out thousands on a motorhome or tearing the seats out of your family waggon, then worry not. You can now hire a campervan right here on the Cool Camping website, with a host of campervan hire companies listed for your perusal. Vintage VWs are some of the most popular picks, with rental companies spread across the UK and Europe, but there are other, more modern options too. And with many available by the night, you need only take it out for a short weekend and you can still get your adventure fix. As always you can find and book the best campsites right here on coolcamping.com. Simply enter dates and search from our homepage to find the right campsite for you in the UK, France or Europe. Once you've searched, select 'campervans' to make sure you find a campsite that accepts your four-wheeled friends and off you go... Happy camping! And finally, remember, if you book online on coolcamping.com before 10th June you'll be eligible to win a whopping £1,000 worth of camping equipment! Simply make your booking on the Cool Camping website and you could win this incredible prize. Plus, one lucky runner up will also be given a Coleman tent worth a further £140! Award-winning insurer for campervans, motorhomes and caravans, Comfort Insurance, has celebrated its 25th birthday by selected the 25 best destinations to visit in the world, taking a steer from passionate leisure vehicle owners across the UK.